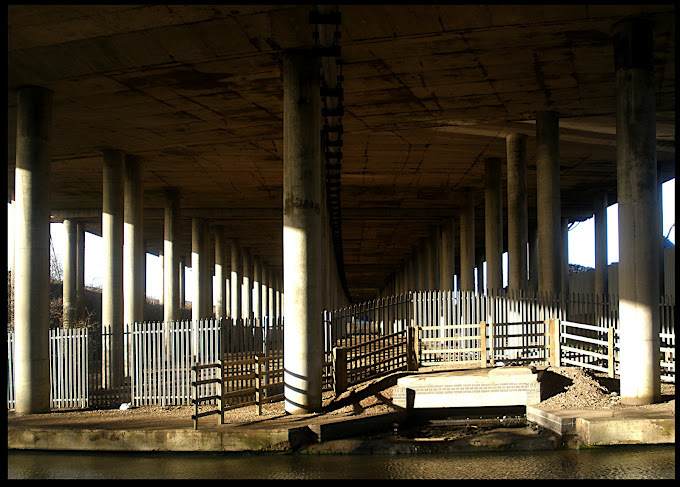 The light on this particular day was diffuse and bright, and the under bridge view from the towpath of the canal was impressive in scale and subtle in tonality — the columns seemed to have all the presence and grandeur of a classical temple. This bridge is one of the largest single constructions in the whole area dominating the entire Northern aspect of the village. With five rows of 50 columns comprising a grand total of 250 continuing from the canal for five hundred yards across the railway lines and then Longford Road in the far distance, its epic scale is inescapable. It's also extremely noisy up to half a mile away anywhere downwind of it.